Help Stanbridge College feed a furry friend in need! 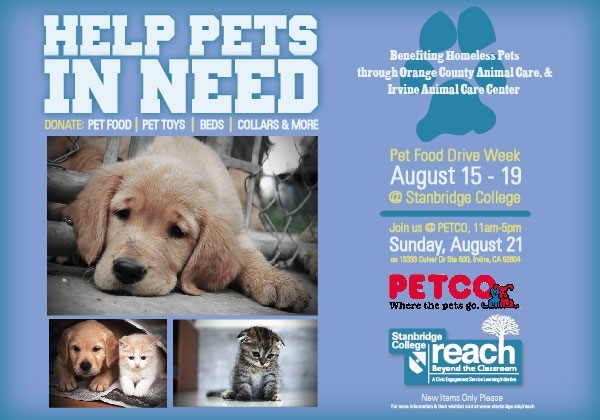 Stanbridge College has TWO exciting events in August to help feed and provide much needed care for homeless pets in Orange County. Take part today! We are holding a Pet Food and Supplies Drive for homeless pets and Orange County Animal Care shelter from August 15th through August 19th. A donation bin will be located in the Stanbridge College student lounge. To view a complete list of donation items please click here to download the PDF wish list. *The Orange County Animal Care Center needs a wide variety of supplies for all aspects of their operations. If you are able to, please donate items for their animals as well as supplies for their office and daily operations. On SUNDAY, August 21st, Stanbridge will be setting up a table outside of PetCo in Irvine for people to donate food, toys, supplies and other items. All donations will benefit the Irvine Animal Shelter. We will need several volunteers to help run our donation table from 11am to 5pm in a morning and afternoon shift. We are also encouraging people to bring donations of food, bedding, toys, office supplies and more. Donate: Food, bedding, toys, office supplies* and more. Click here to download PDF wish list here. *The Irvine Animal Care Center needs a wide variety of supplies for all aspects of their operations. If you are able to, please donate items for their animals as well as supplies for their office and daily operations. We hope you will join us in contributing to the aid of Orange County animals in need.